The 2018 Royal Enfield Thunderbird 500X is my ideal motorcycle, if it was launched circa 2006. Back then, I was fresh out of high school and studying to be a designer in a different part of the country. 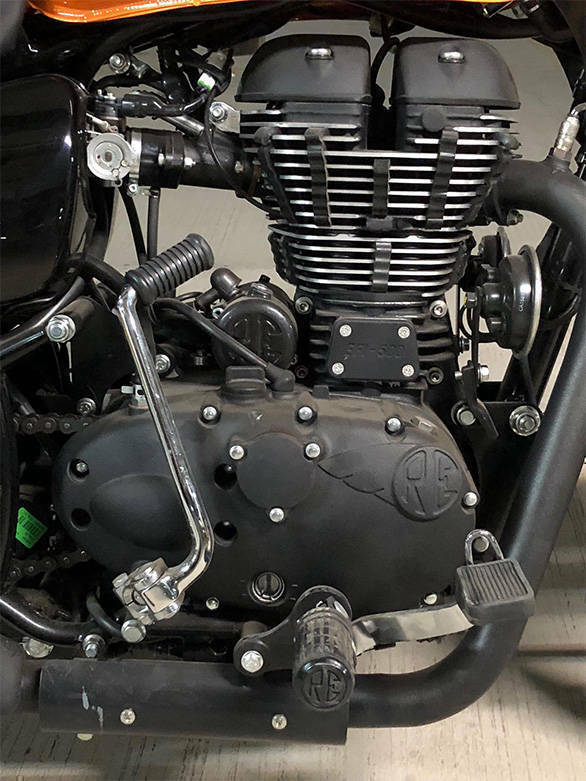 Every weekend that I was not riding, I was trying to make my 2005 Royal Enfield Thunderbird fit into the ideal image of a standard motorcycle. Motorcycles like the Honda CB400 Super Four, which I had grown up lusting after but never had access to. While the power and riding style were worlds apart from the Japanese naked, the old Thunderbird did have the retro look down pat. And I did my best to make it fit the image I carried in my head. I had replaced the stock cruiser handlebar with a flat, wide one, changed to a shorter matte black aftermarket exhaust, removed the pillion backrest, changed to a thinner, flatter seat, and changed to a tinier LED tail lamp. If I had had the money then, I'd have surely tried to fit the bigger 500cc engine from the then Machismo 500, and painted the rims and all mechanicals black. I did also consider painting the tank into the powder blue from the Gulf Racing colours, a wish I hold to this day. 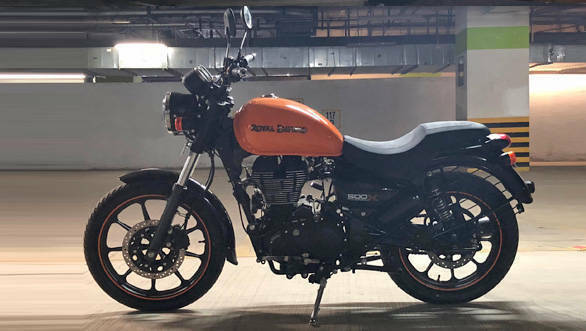 Until of course, yesterday, when Royal Enfield launched the Thunderbird 500X and Thunderbird 350X, offering most of these changes straight out of the factory. Royal Enfield even has its own take on my favourite light blue, which it calls Drifter Blue. 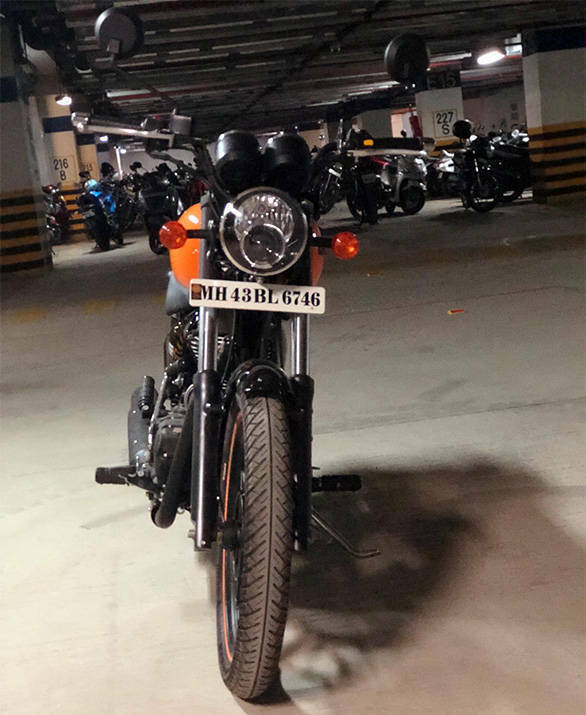 To top it off, a strange set of circumstances landed me with the keys to the 2018 Royal Enfield Thunderbird 500X on a Thursday afternoon. It is essentially a reskin of the standard Thunderbird 500. Royal Enfield says the Thunderbird 500X is aimed at 'urban explorers' - young city slickers for whom motorcycling is a lifestyle choice and not just a means of commute. The 500X takes away the old-school cruiser charm of the Thunderbird and replaces it with a bold, modern aesthetic. The mechanical bits are all painted black, and the fuel tank gets one of four bright new paint options. 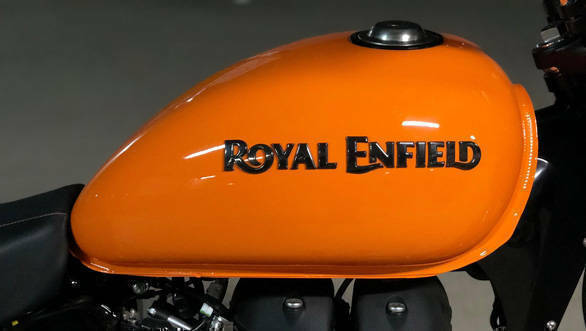 Royal Enfield offers four new paint options - Getaway Orange - the colour of our review bike - and Drifter Blue for the Thunderbird 500X and Whimsical White and Roving Red for the Thunderbird 350X. 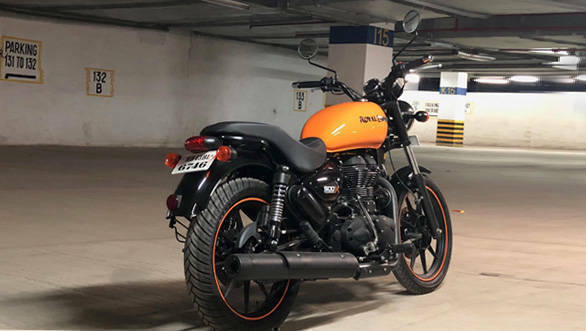 The bright paint only covers the 20-litre fuel tank, while the rest of body the including mechanicals, mudguards, headlamp casing, side panels and exhaust are all blacked-out for a cleaner, custom-built look. The seat itself is now a single-piece unit, with a central patch featuring a fabric piece for comfort during long hours in urban conditions, as well as better grip. Although there is no change in the seat height, it looks much sleeker than its Thunderbird counterpart. The cruiser handlebar has been replaced by a flat, low handlebar in black finish, which offers a more upright riding posture as well as helps navigate traffic easier. The Thunderbird 500X also features 9-spoke alloy wheels, for the first time since the Royal Enfield DX 175 Fury of the 1980s, as well as company-first, tubeless tyres. These offer a premium look, while also being a clear indication of the motorcycle's intended use in an urban setting. 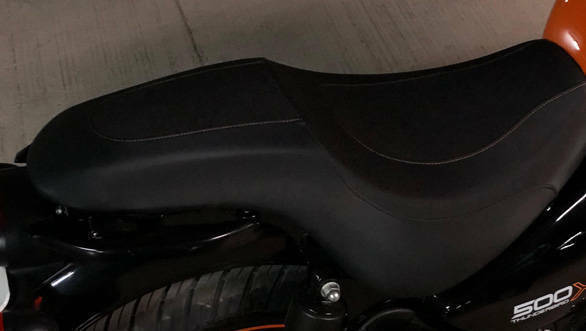 The pillion backrest from the standard Thunderbird has been replaced by two blacked-out grab rails on either side of the pillion seat on the 500X. These feel good to grip and also give the rear a clean look. In essence, the Royal Enfield Thunderbird 500X is the motorcycle I have seen a section of Royal Enfield buyers customise on their own. But this time, it comes ready, and with a company warranty. Royal Enfield has effectively cut out the middleman (customiser) by offering the same changes straight out of the factory. 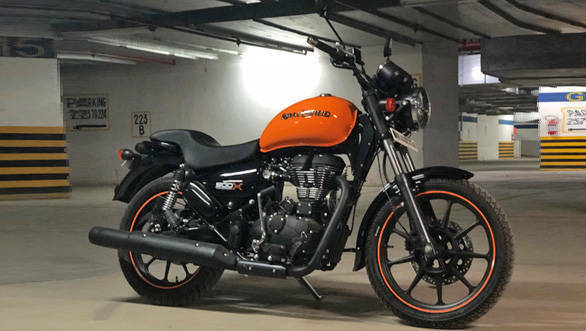 At the same time, it refreshes the Thunderbird line-up to make it more relevant in the current scenario where a variety of motorcycles are on offer in the Rs 1.5 to Rs 2 lakh budget. The 500X has no mechanical changes from the standard Thunderbird. It comes powered by the same 499cc air-cooled fuel-injected single cylinder engine, producing 27.5PS and 41.3Nm. It is mated to the same 5-speed gearbox too. The physical dimensions are the same as well. And while I did believe there would be a small change in the kerb weight, even that is identical to the Thunderbird 500 at 197kg. So, with no change in these parameters, the performance will remain similar to the Thunderbird 500. In our last road test of the Thunderbird 500, we had noted a top speed of 119.32kmph. In our economy run, it had returned fuel efficiency figures of 33.20kmpl in the city and 37.41kmpl on the highway. You can expect similar results with the 500X, and we will confirm the same in our road test soon. The big change on the 500X is in the riding position, which is more like a standard motorcycle now, thanks to the lower, flatter handlebar. The handlebar is easier to reach and for this reviewer's 5-foot-10 frame, the grips are at a natural reach angle. The shorter length offers more direct control and feedback making it easier to trundle about on the 500X in traffic. In terms of ride quality, the suspension setup was able to absorb most of the bumpy surfaces I rode it through without any drama. This also resulted in assured handling with a responsive feel. What needs an upgrade is the brakes. 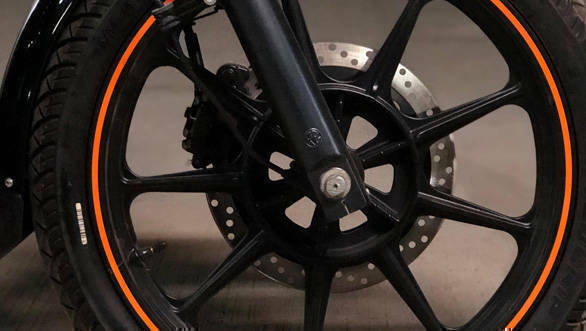 Although there are discs at both ends, they take time to bring the bike to a halt from speeds above 80kmph, and ABS is not on offer even as an option. The seat contour is slightly different and felt comfortable throughout a busy afternoon ride through Mumbai traffic. Worth noting here is the central fabric trim on the rider and pillion seats. This patch feels grippy enough to reduce lateral movement. It is also more breathable than the faux leather found on the standard Thunderbird. When you spend a couple of hours in stop-go traffic, sweat is a genuine concern, and this fabric patch seemed to address that during my time spent riding in 33-degree weather. Also, with the pillion backrest gone, swinging your leg over the motorcycle is a tad easier. As a whole, the Royal Enfield Thunderbird 500X is good package. At Rs 1.98 lakh (ex-showroom) it is priced roughly Rs 8,000 more than the Thunderbird 500. For that difference, you get alloy wheels, a cleaner look with contemporary colour options along with a seating position better suited for urban conditions. And while I may have outgrown my Thunderbird days, there is certainly a younger crowd that will find the 500X just right for a relaxed ride around town or even short jaunts up the twisties on weekends.